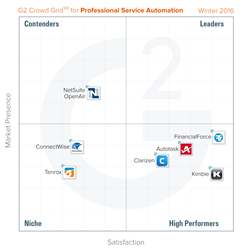 G2 Crowd, the world’s leading business software review platform, today released the Winter 2016 Professional Service Automation Software Grid report to help businesses make the best technology decision. FinancialForce PSA, Kimble, Autotask, and Clarizen were named High Performers in the report, earning strong customer satisfaction marks with smaller market presence scores. FinancialForce earned the highest overall satisfaction score while NetSuite OpenAir earned the highest overall market presence score. Difficulties with setup — Setting up PSA platforms is an elaborate process that many users found difficult and time consuming. Ease of setup received an average satisfaction rating of 71 percent, the lowest satisfaction score in the category. Help with implementation — Many users noted that assistance from the vendor support team or a third party consultant was very useful when implementing a PSA solution. There were not any solutions in the category that 100 percent of reviewers were able to implement with in-house staff. Support is crucial — Due to the range of PSA solutions, customer service is essential. The solutions with a higher quality of support satisfaction rating were more likely to be recommended by users. Roughly 30 products are listed in G2 Crowd’s Professional Service Automation category. To be included on the Grid, products had to receive ten or more reviews.